Still life, an ancient art form, has varied in importance and vitality over the millennia. The painting of Egyptian tomb walls with depictions of food and everyday objects had a spiritual yet pragmatic objective. These works were thought to become real and accompany the deceased into the afterlife. Later, the Romans and Greeks took pleasure in still life painting, though largely for its decorative aspects. For them, the focus was on beauty and the artist’s skill. In paintings from the Middle Ages to the Renaissance, important elements of still life are present, though generally as support to the primary religious subject. We see aspects of still life in the detailed realism and disguised imagery of paintings from these periods. Perhaps no artist better exemplified this than Flemish painter Jan Van Eyck. With his keen grasp of symbolism, Van Eyck focused intensively on realistic portrayals of everyday objects as iconography and metaphor for life’s mysteries. He and others paved the way for the forthcoming heyday of still life in Northern Europe. It began in the new artistic climate of the 17th century Netherlands. Under the Dutch Reformed Protestant Church, artists were forbidden to depict religious subject matter. This new decree barred artists from what had long been their staple. Turning away from religion, yet maintaining their passion for hyper-realism and hidden symbolism, artists began painting what were called “Vanitas paintings” (Latin: vanity). These breathtakingly realistic portrayals of food, flowers and household objects critiqued an increasingly materialistic Dutch bourgeoisie. The symbolism often focused on the fragility of worldly existence. The popularity of Vanitas paintings, and still life in general, quickly spread throughout Europe. It wasn’t until the rise of the Academies in 19th century France that still life began to fall from favor. The doctrine of “Hierarchy of Genres” was introduced, which held that a painting’s artistic merit was based primarily on its subject matter. Portrayals of historical and biblical images soon superseded still life art. The genre did not return to its former place of prominence until the ascension of the Impressionists and Post Impressionists. For these artists, from Cézanne to Van Gogh to Gauguin, still life offered the opportunity to celebrate the significance of design. In his iconic fruit and flower still lifes, Paul Cézanne prefigured Cubism and abstract art with his emphasis on geometric and spatial organization. In the 20th century, still life became fundamentally linked with the dismantling of long-standing principles such as the need for realistic representation. Beginning with Picasso and Cubism, still life grew increasingly conceptual. However, citations of the 17th century Dutch still life masters are readily apparent in the works of artists such as Andy Warhol, and photographer Robert Mapplethorpe. 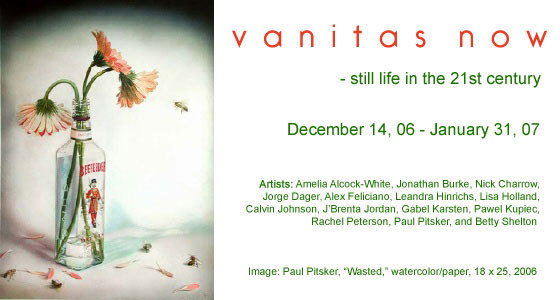 For “VANITAS NOW,” Art Murmur Gallery presents the rich tradition of still life as seen through the eyes of the contemporary artist.